Following an "ordinary suburbanite" childhood in Falls Church, Virginia, Dan Armstrong went for a degree in aerospace engineering at Princeton, and also joined an emerging environmental movement. "I attended the first Earth Day in '71," he says. "I wrote my junior paper on climate change." Deciding that he wouldn't work for a weapons maker, he instead "became a hippie" and came to Eugene in 1973 for grad school in journalism. When his thesis proposal was rejected, he dropped out to pursue fiction writing. "I've written short stories, novels, and environmental articles," he says. "I supported myself as a house painter for 30 years." After 13 years away in Portland and six in Astoria, Armstrong returned to Eugene in 1998. Since 2002, when arthitis put an end to house painting, he has written three novels and become an electronic publisher. "Prairie Fire has been my most successful book," he says. "It's about an American family farmer. I find the best way to inform people about the environment is through the lens of food." 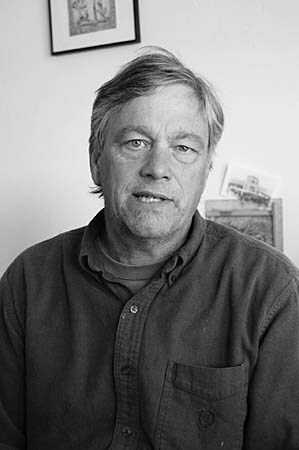 Read some of Armstrong's stories and essays, and learn about local environmental efforts such as the Southern Willamette Valley Bean and Grain Project on his website, mudcitypress.com.